The big day is right around the corner. Need a little grounding this Thanksgiving? Here’s a selection of Thanksgiving Day classes throughout the Chicagoland that are sure to help you get centered! BONUS: Get into the grateful spirit early with the whole family on November 17th at Bloom Yoga Studio! Are you an early riser? Get things started bright and early at Twisted Tree Yoga with a 6:00 AM practice. Forever Om Yoga Studio is offering TWO opportunities to practice at BOTH locations. In Lake Forest, Turkey Prep (HOT) kicks off at 7:00 AM and Turkey Burn (Hot Power) is at 8:30 AM. In Vernon Hills, Turkey Prep (HOT) is at 9:00 AM and Turkey Burn (Hot Power) follows at 11:00 AM. Start the day off at 8:00 AM with a Gratitude Kati Flow, lead by InnerJasmine’s own Katya. 2 Hot Yoga is heating things up in the morning with two practices – a hot class at 8:00 AM (for those who like it HOT) and a warm vinyasa flow at 9:45 AM. Black Cat Yoga’s Perky Turkey Flow is the perfect way to set the tone for the day. Class kicks off at 8:30 AM. Jai Yoga Studio will hold one class on Thanksgiving morning – a beginner flow at 9:00 AM. On Thanksgiving Day, Bloom Yoga Studio is holding three classes – Level 1/2 at 9:00 AM, Gentle Yoga & Meditation at 10:30, and Level 1/2 at 12:00 PM. 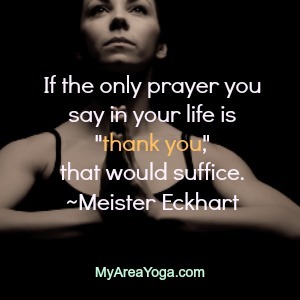 Eb & Flow Yoga Studio is holding a special 9:30 AM Gratitude Flow. Tejas Yoga is starting off the day with open level class at 10:00 AM. It’s Tadasana, then Turkey at the Yoga Shop! Class kicks off at 10:00 AM. There are tons of amazing events coming up in the Chicagoland. Find more on our event calendar!